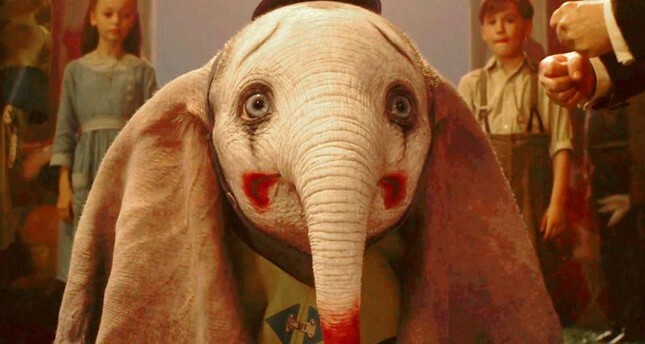 "Dumbo," starring Eva Green, Colin Farrell, Michael Keaton, Danny DeVito, Nico Parker, Finley Hobbins, Joseph Gatt, Alan Arkin and Sharon Rooney in the lead roles, is directed by Tim Burton with scriptwriting by Ehren Kruger. In the film, an elephant named Dumbo, who can fly with his oversized ears, attends a circus where he, along with his friends, discover the dark secrets of this organization. A new adaptation of "Hababam Sınıfı" ("The Class of Chaos"), a classic movie of Turkish Yeşilçam cinema, "Hababam Sınıfı Yeniden" ("The Class of Chaos Reloaded") will meet spectators this week. Directed by Doğa Can Anafarta, the film stars Altan Erkekli, Toygan Avanoğlu, Hande Katipoğlu, Sadi Celil Cengiz, Yusuf Çim, Özge Özacar, Giray Altınok, Sami Aksu, Nazlı Pınar Kaya and Fırat Albayram in the lead roles. The film is written by Evren Erdoğan and Ayşe Balıbey. It tells the story of a problematic class after a private Çamlıca high school starts become a co-education space. Written and directed by Onur Barış, "Benden Hikayesi" ("Story by Me") stars Mert Er in the lead role. The film will reflect the life story of famous writer Sait Faik Abasıyanık with some impersonations. The movie revolves around the concept of good intention, which Abasıyanık unifies with nature and human love. The name of the film comes from the last line of Abasıyanık's renowned short story titled "Son Kuşlar" ("Last Birds"). "Suç Unsuru" ("Crime Factor"), written and directed by Süleyman Arda Eminçe, reflects on the events that develop after a police raid at two close friends' houses. The film features Koray Erkök, Bülent Çolak, Altuğ Elveriş, Burak Sarımola, Emre Şen and Duygu Yıldız. Starring Zachary Levi, Mark Strong, Asher Angel, Jack Dylan Grazer, Michelle Borth and Adam Brody, "Shazam!" is directed by David F. Sandberg. In the film, 14-year-old Billy Batson turns into a muscled hero who has the power of six characters and wears a cape. While he tests his limits he also has to struggle with the task of defeating Dr. Thaddeus Sivana, the villain in the film. This film focuses on the story of Forrest Tucker who escaped prison many times during his long criminal career and for the last time, at the age of 70, he wants to attempt one last robbery. "The Old Man and the Gun" stars master actor Robert Redford in the lead role. The successful actor is accompanied by Sissy Spacek, Casey Affleck, Danny Glover, Tom Waits, Tika Sumpter, Ari Elizabeth Johnson, John David Washington and Elisabeth Moss in the cast and is directed by David Lowery. Directed by Kevin Kölsch and Dennis Widmyer, "Pet Sematary" tells a chain of events experienced by a man who moves to rural Boston with his two children and wife and discovers a cemetery deep in the forest. The horror movie stars Jason Clarke, John Lithgow and Amy Seimetz in the lead roles.